PCA members are deeply passionate people, and deeply invested in both Porsche as a brand, and as an institution stretching back decades. I've been a concours judge, and observing PCA concours judging in person is an intense experience; the breadth of knowledge about materials, finishes, and even fonts shared by these people is immense. Porsche appreciates that, and when it comes time to create a timepiece, they embrace that level of enthusiasm. Porsche Design's timepiece, the Porsche Design Chronograph 70Y Sportwagen PCA Edition, embraces 70 years of Porsche heritage and wraps it in Porsche Design's new top-of-the-line timepiece. Limited to just 70 pieces globally, it features Porsche Design's first-ever proprietary movement; the Werk 01.200 with Flyback function, load-path optimized movement bridge, and COSC certification to guarantee maximum precision. Each unit is numbered, and can only be purchased by PCA ID holders. 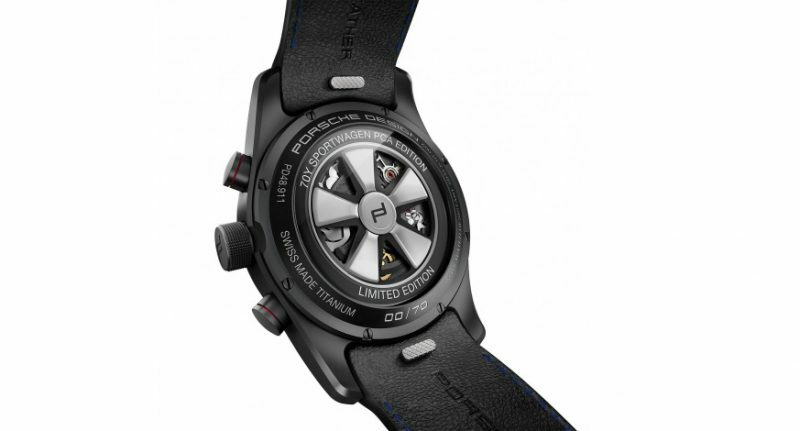 Porsche Design incorporates numerous design cues from historic Porsche models. The rotor is styled to resemble the classic Porsche Fuchs alloy wheel, a world-first in high-end timepieces. The shape was specially approved by Porsche cars for use on this special timepiece. For the first time, Porsche Design created their own bespoke movement. Where the Rennsport Edition VI Chronotimer used a ETA Valjoux 7750 movement, the new timepiece uses a COSC-certified Porsche Design Caliber WERK 01.200, Chronograph with Flyback function. Even considered alongside the rest of the Porsche Design lineup, this makes for a unique timepiece. The new movement and rotor fit in a 30mm movement housing, and afford a 48 hour power reserve. The 25 jewel movement operates on a 4Hz (28,800/hour) frequency. The titanium case measures 42mm in diameter and 15.33mm thick. The front and rear faces are convex Sapphire crystal with scratch-proof hard coating and sevenfold anti-glare coatings. The rear fascia is the screw-down type, exposing the Fuchs-styled rotor, and the case is water-resistant up to 5 bar. The dial blends classic styling with modern materials, and incorporates white indices with a mechanical function display at 9 o'clock over a carbon face. A 30-minute counter is positioned at 12 o'clock with a 12-hour counter positioned opposite at 6 o'clock. The date window is stationed at the 4 o'clock position. The strap is constructed of vehicle-grade calfskin leather with black Alcantara accents. Red stitching is used on inner surfaces, contrasted by blue on the outer surfaces. 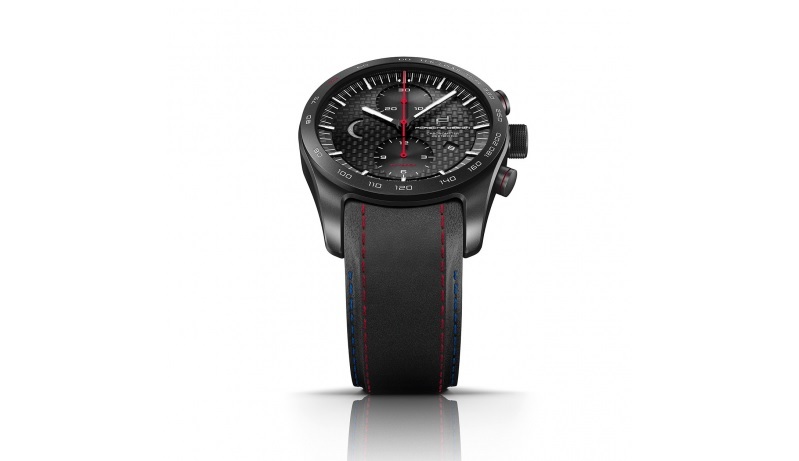 The strap shares its quick-release system with most current Porsche Chonographs, and a large strap is available upon request. The new timepiece is available for pre-order on the Porsche Design website, and at press time approximately 20 of the seventy numbered pieces are available. This limited edition piece will retail for $9,911, and will be available for sale and viewing at Rennsport VI. Rotor: Porsche Design - Rotor "Fuchs"